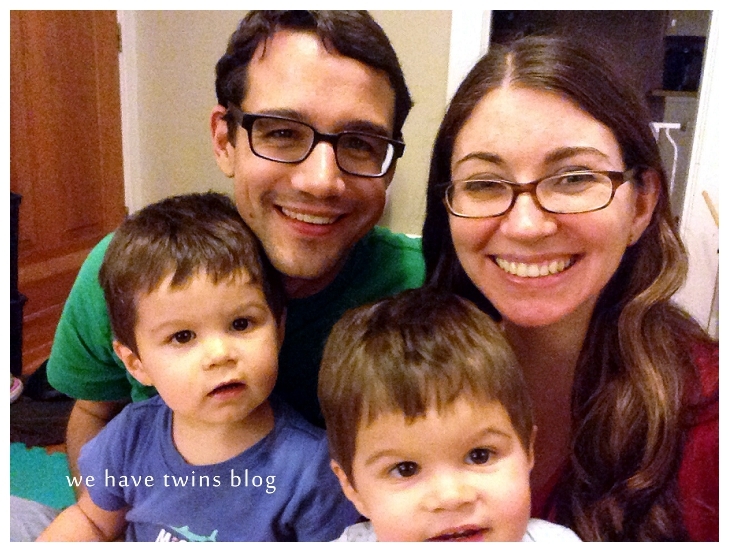 letters to twins | We Have Twins?! We have four year olds! Big, giant, articulate four year olds. Who give spontaneous hugs and kisses, who fall to the floor yelling about not enough cheerios in their snacky cup, who scale couches and counters, who can entertain themselves and each other, who sometimes share nicely and who sometimes fight like dogs over jammies or toys, who can recite entire books, and so much more. Physical changes: they are definitely taller, and they’re wearing size 9 shoes right now. Their enunciation has improved dramatically–they don’t sound like toddlers anymore; they’re articulate like little kids now. Fully in the “actually” stage. No more naps, not even car naps. 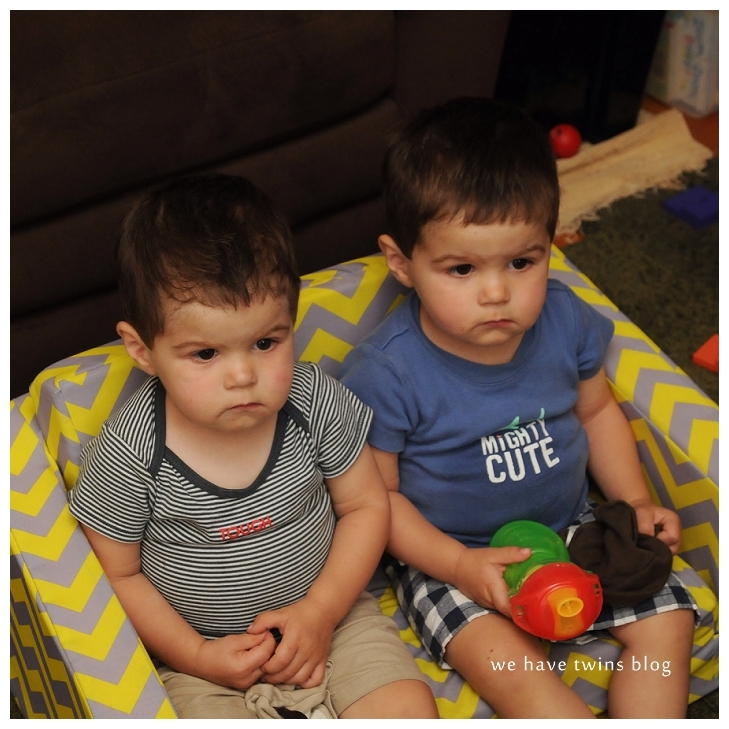 We found that bedtime was easier without them, and though they definitely get noticeably cranky sometimes in the afternoon, it’s usually fairly smooth to just make it through. This summer we did nighttime potty training, which involved us waking them up overnight to go potty while they were still half asleep. We started this process in June, I think, and we gradually changed the times, and in October we stopped waking them up, and they made it through the night! There have been just a few accidents since. Overall a massive improvement in all our lives to have that taken care of! Also, the whining. So much whining. Can you hear the whining that was happening in this picture? I’m probably a terrible person for taking a photo, but this child whined nonstop for at least twenty minutes the first day we went up to Salmon Days (a local festival near Seattle). There is also near-daily whining about food, either because someone wants food or wants more food or wants different food. I think one of the theme phrases for right now is “I’m hungry still” in a whine. However, they also run up and give me spontaneous hugs and kisses. They love playing chase games and tickling games. They say, “You’re my best friend!” M tells me that he’ll always be my baby even when he’s a grownup, because that’s what I tell him, which is too adorable. They are really sweet and wonderful boys like 85% of the time. It’s just that that 15% is SO very annoying. Since the last post, we had some good summer adventures, like a million fruit-picking days (fresh raspberries are the best!!! ), and two trips to the coast. Our annual 4th of July trip to the Hood River Valley to pick cherries and visit Mt Hood was a success. The boys were a little confused with the snow. We all went bowling together! They wanted to roll their bowling balls just like us, and they actually did really well. E won the first game! With the bumpers, obviously. After admiring the roller coasters at the Clark County Fair and at Oaks Park last year, this year they actually went on those kid roller coasters! M especially loved the Oaks Park one; he went like five times on the last trip there this fall. Here he is with A on the Clark County one. 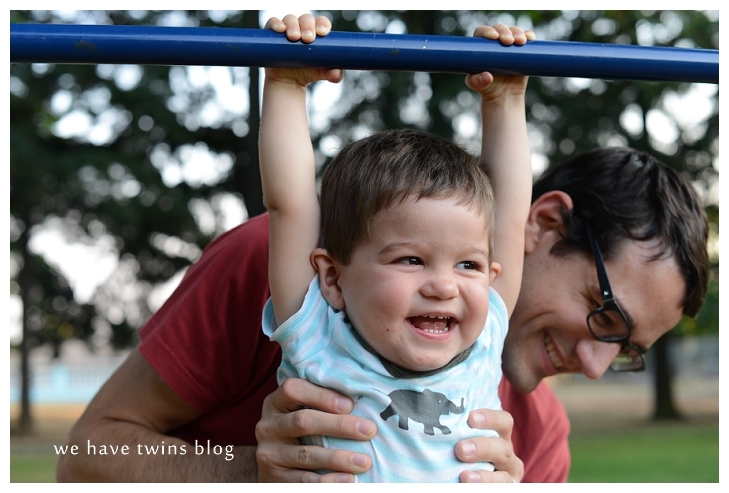 At first, E didn’t want to do the roller coaster, but after he saw M do it, then E wanted to. And he was so excited about it! We got in a few trips to Oaks Park too, and they were tall enough for just about all the kiddie rides. The Froghopper was a favorite for all of us. Birthday party time!! This year they asked to have their party at JJ Jump.We had a few friends come, and everyone had a good time bouncing and jumping all over the place. Thanksgiving headbands required some serious persuading this year. We had our now traditional dinner at the Edgefield buffet, and like always, the boys mainly ate bread and fruit and dessert. M did have some turkey, and I helped E have a couple bites too. So much energy these two have!! I’m glad we got that trampoline last Christmas; it’s a great way to bounce out some energy on the dark evenings after daycare. I had them help me make Christmas cookies in December. It was super adorable how excited they were to help cut out the shapes, and then decorate them. 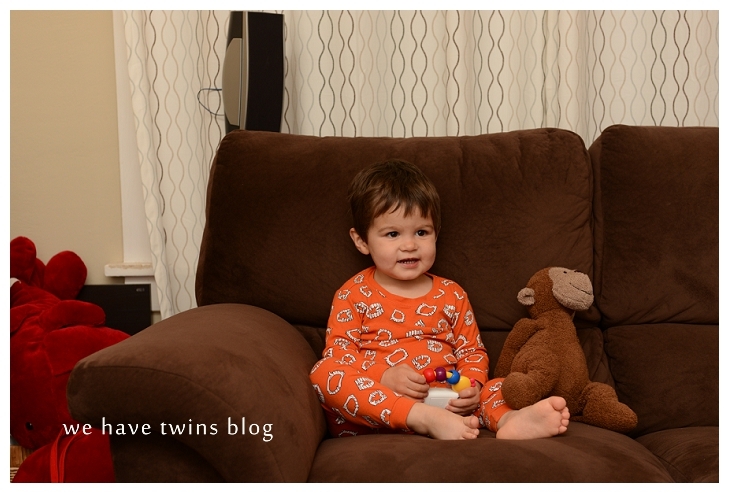 This fall we *finally* moved up bedtime to 730, and that’s made a huge difference. (We’d been getting them up to their room between 815/830, and it was always a giant headache, and it would take them for-e-ver to fall asleep.) Now we are usually done with the bedtime stuff around 8/815. So nice to have more quiet evening time! The boys often stay up a little longer reading in their beds with little LED lights, which is really sweet. They love drawing and coloring. They still mainly do scribbles and coloring in patches, not really trying to draw people or objects. They can sort of color within lines. Just recently they started drawing shapes, like all kinds of circles or triangles. Sometimes they include letters, but usually not on their own. M wrote his whole name last month, sort of! They love cutting “tickets” with their scissors. Just very recently M got a little obsessed with paper snowflakes, so I’ve helped him make at least a dozen or more. There are tiny pieces of paper littering their table area more days than not. M is totally and completely in love with potty talk. Poo and pee are now some of his favorite vocabulary words. One memorable example was his version of Jingle Bells where he replaced ALL the words with either ‘poo’ or ‘pee.’ Oh, four-year-olds. 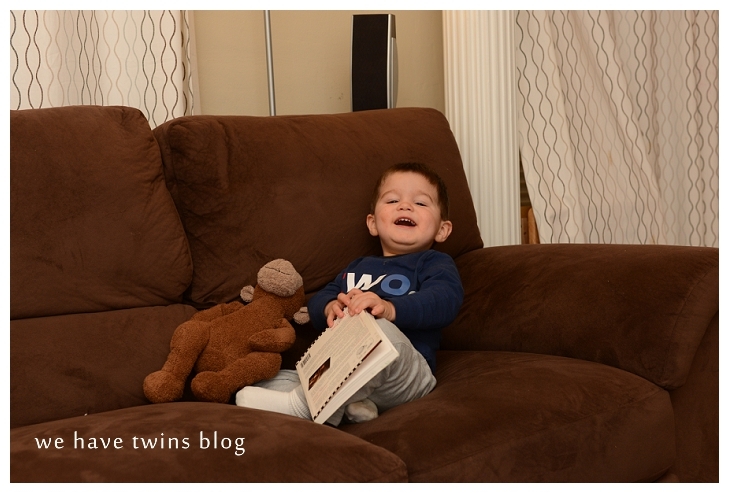 They’re into books, as always–especially Curious George (that’s them listening to the audio versions!) and Berenstain Bears. Daniel Tiger has waned a bit. 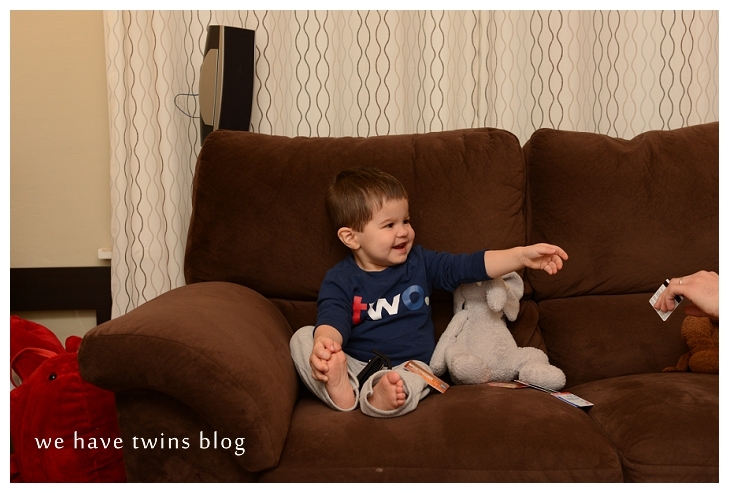 For TV, they love Little Einsteins, and sometimes still Super Why and Curious George. Seriously. Look at these sweet faces! We love them so much! 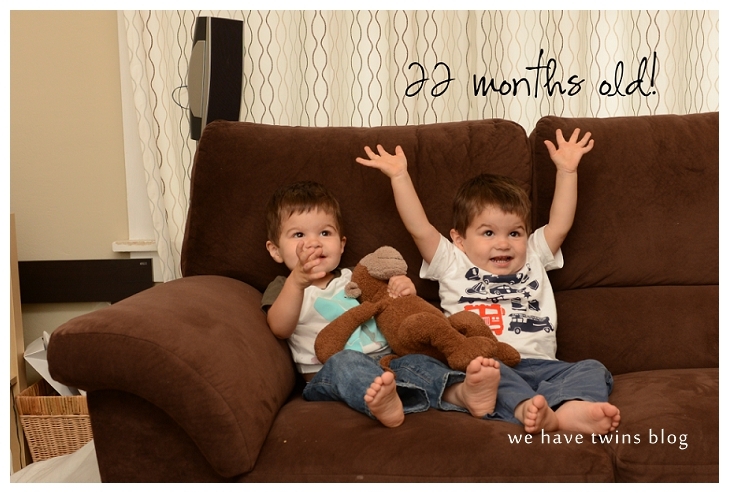 The boys are 3 1/2! And man, we are definitely living with three-year-olds. (Though M says, “I’m thirty-five,” because that’s how much he weighs.) There are a lot of tantrums–most of them are about food, and most of them are when the boys are tired and/or hungry. Sometimes they’re both having a tantrum at the same time. Fun! Some very common phrases in our house right now include, a whining “I don’t have that much!” which can refer to anything from a pile of magnatiles or a bowl of blueberries. And “You won’t be my best friend anymore!” which is so hilariously threenager that I can’t even take it. 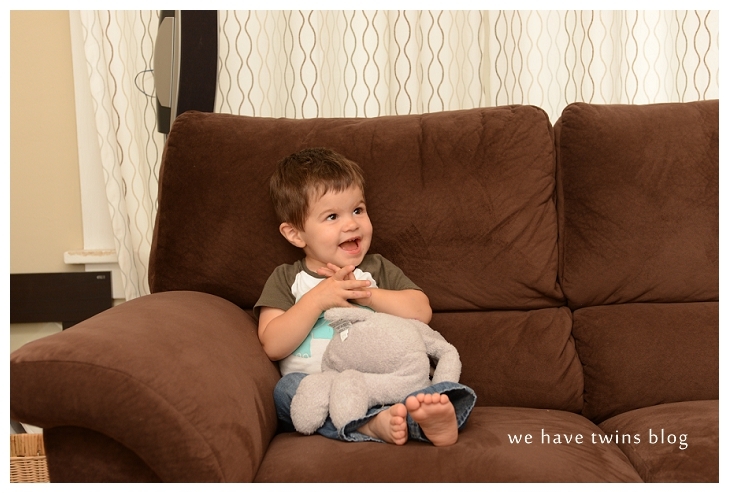 Emmett’s also in a phase of responding to any question with “no” and a cheeky grin. Like, “You guys went to the park today?” “No.” “Did you have fun at the play cafe?” “No.” Silly goose. Oh, and if one of them is mad at us, they yell, “Don’t Talk To Me!” Drama galore! Potty training is going great. 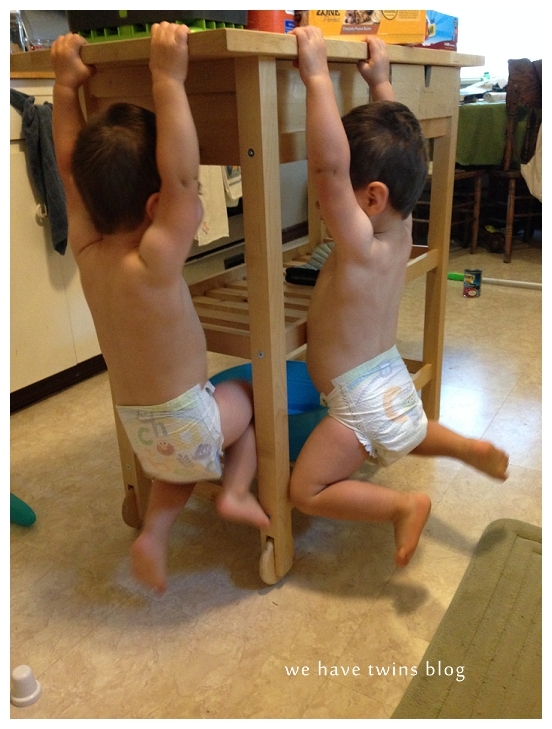 They’re both in undies all day with no problem (they FINALLY are doing well with potty at daycare) and are in pullups overnight. We’re dreading the ordeal of night training, so we’re still procrastinating on that. We made progress on another big-kid update: On Easter Sunday, we randomly changed the cribs to toddler ‘beds.’ It was a rough transition. The first night was actually full of screaming. (Our fault for not preparing them and doing this so randomly.) In the first week, there was some accidental rolling out of bed, there was some purposeful getting out of bed, there were screams, and giggles, and taking forever to get to sleep. Oy, it was so frustrating! However, now that it’s been a couple months, the misbehavior has subsided. There was a fun few days when they were running out of their room giggling after we’d put them to bed. After we shooed them back, we could hear them plotting: M: “Let’s wait till they go away, then we’ll out of bed!” E: “Okay!” (ARGH, twins!) Thankfully, it was only a few nights. Relatedly, the boys are no longer napping at home. (They are still napping at daycare, though.) This shouldn’t be a surprise, with the bed change and their age, but it is not a welcome update. We really needed that daytime break on weekends–for work, for our own naps, for trips to the gym or grocery store. And, you know, for sanity and some freaking silence. There is good news though: we’ve started doing a 30-40 minute car nap, which makes the evenings much less cranky. Plus they go to bed a little earlier, and sleep more soundly, and sleep in a bit later. Fewer bedtime shenanigans too. And of course not having to be home for several early afternoon hours really opens up our schedule for events and outings! I really like not having to live according to a nap schedule. Mornings have changed a bit too. 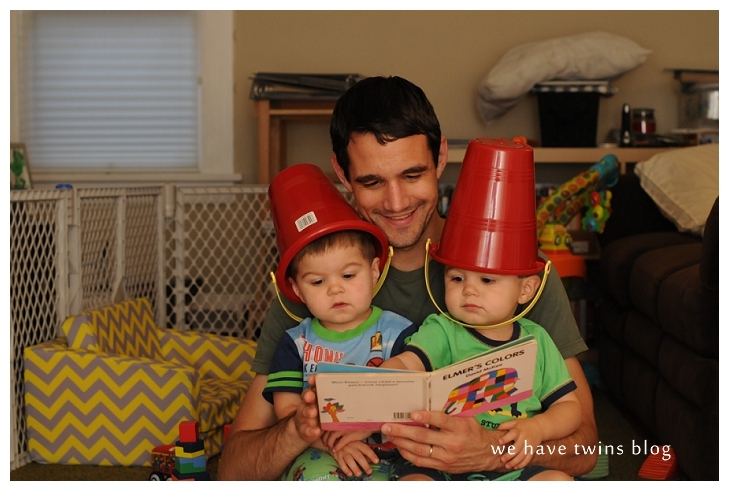 Once they could get up easily by themselves, they’d just start playing magnatiles together, or reading. But often they’d start arguing, and pitter patter into our room, saying, “He won’t share!” or “I don’t have that much!” For the last couple months now, the routine is that they get out of bed and come in to our room, crawling up on our bed to snuggle. It’s pretty stinking adorable to open my eyes to Emmett’s or Malcolm’s sweet face with a big huge grin. Plus it means we can be lazy and stay in bed longer. I’ve been taking the boys to the local library branch every couple weeks. 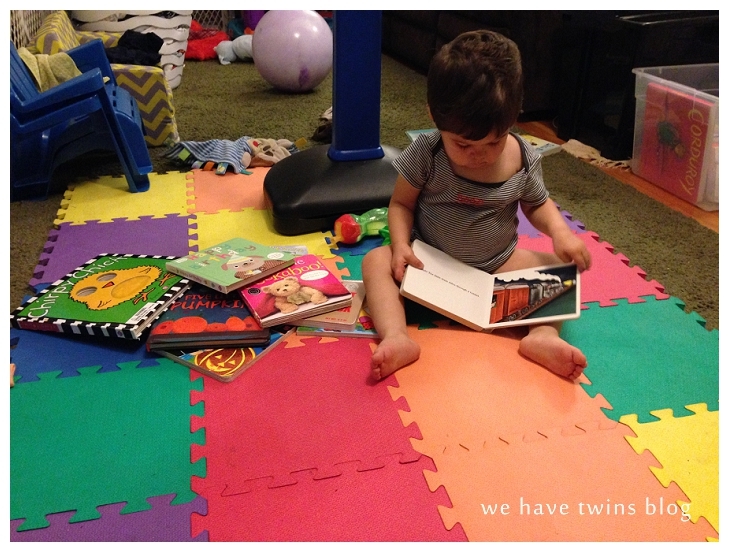 They love picking up piles of random books and piling onto my lap to read them, and then checking them out. And of course they like returning them into the book drop! I’ve been taking snapshots of the haul each time to keep a record. It’s funny how they’ve gotten really attached to some of the books. And some of the books are really odd, like one they loved was Pat-a-Cake Baby…which I swear was written on some kind of drug trip. We have a growing (alternately very hip and very unhip) playlist of mostly ‘grown-up’ music that the boys are into right now. Which is great, because it’s all from our own music libraries, so I like the songs. (As opposed to, say, There Was an Old Lady Who Swallowed a Spider, or god forbid, There’s a Hole in My Bucket. WORST SONG EVER.) However, when I inevitably find myself singing along to Chandelier or Blank Space, the boys say, No singing, Mama! After their mind was blown by Under Pressure (this was a few months ago now), they made “microphones” out of chalk holders and they like to “sing” into them. 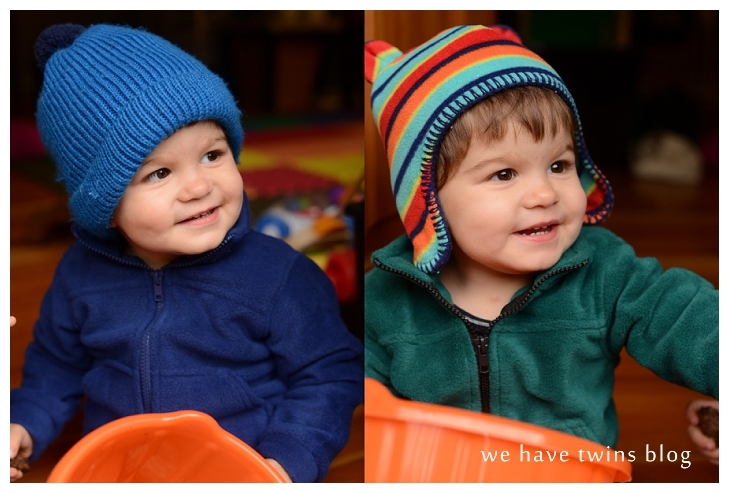 Emmett is always “Fred Mercury” and Malcolm is “David Bowie” or just “David.” Nowadays they sing whatever–sometimes gibberish, sometimes one of these songs (this past week it’s been Shake It Off), sometimes a Red Yarn song (he’s a local kid’s musician). Oh, and now they get to play with the real-looking Rock Band microphone too, which they think is amazing. 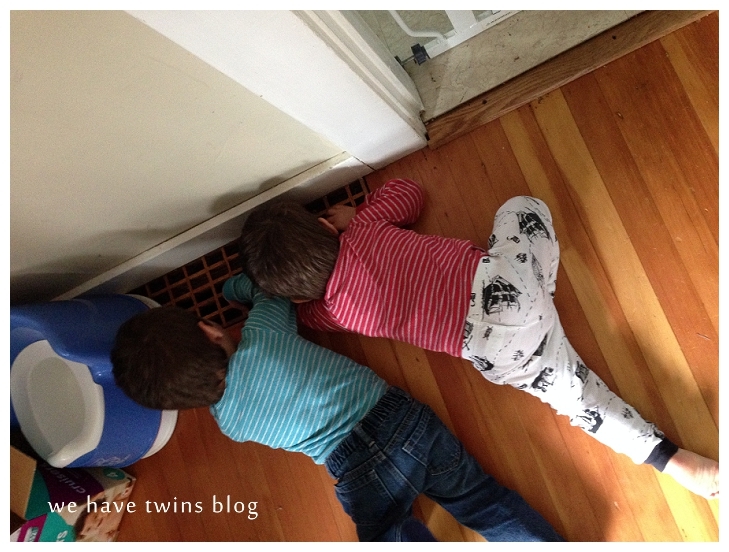 They plug it in to the heating vent in the living room and carry it around the room to sing. 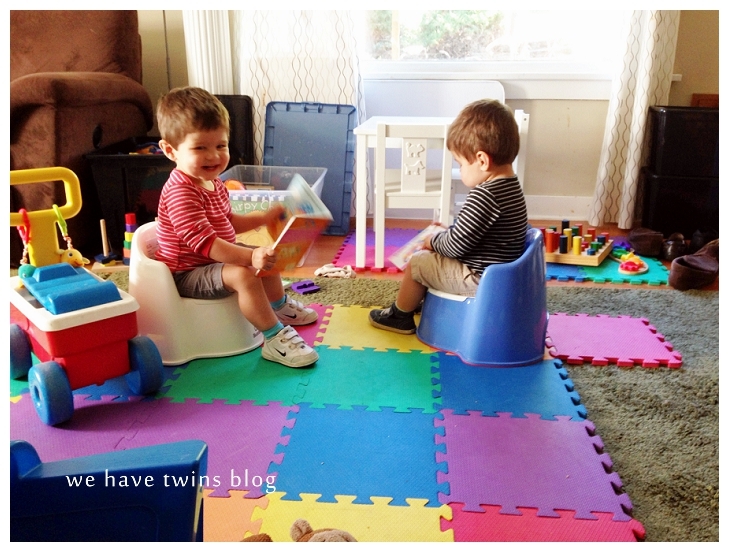 For a few months, they forgot about their magnatiles, but they are firmly obsessed again. (Which means lots of issues about who has more/not enough.) And they’re really into puzzles right now. We have a few sets (thanks Grandparents! ), and they’re able to do them all by themselves now. It’s really cute to hear them parroting things we’ve said about helping them match pieces. I want to be sure to acknowledge that the annoying stuff is not the whole picture. Yes, the typical 3-year-old behavior sometimes makes me want to scream with frustration and impatience (like getting ready for bedtime, UGH the worst)…but there are a lot of wonderful things about this age too. We’ve been doing some baking together occasionally. On Valentine’s Day we all made pink chocolate chip cookies. They did such a great job at pouring and stirring and scooping…and eating the batter. 🙂 They ADORE ‘smoolies’ [smoothies] and helping me make them–putting things in the blender, pushing the button. The other day we made apple carrot muffins, and they poured all the ingredients in for me and helped stir. It surprises me how much they can do. 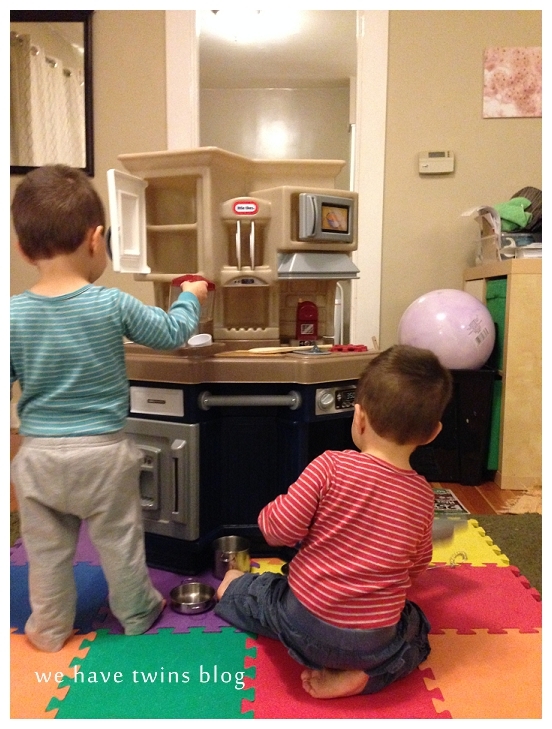 I keep thinking they’re so little and not yet ready for fine-motor manual tasks…but they’re quite agile and capable. We need to remember to allow them to push and explore their physical boundaries. They still love helping and want to help with everything. (This was true a year ago too–but now they can actually do stuff!). About half the time, of course, that helping comes in the form of a tantrum, like the time I got a spoon out of the drawer to make the oatmeal, and then Emmett started hopping and whiny crying, “I wanted to do it!” Being psychic would be helpful for living with three-year-olds. Other cute mis-pronounciations include decker-bocker bus (double-decker bus), hot tog (hot dog), wallermelon (watermelon), and Burger Bill (Burgerville). Oh, and the other day I was talking to them about what they can be when they grow up. 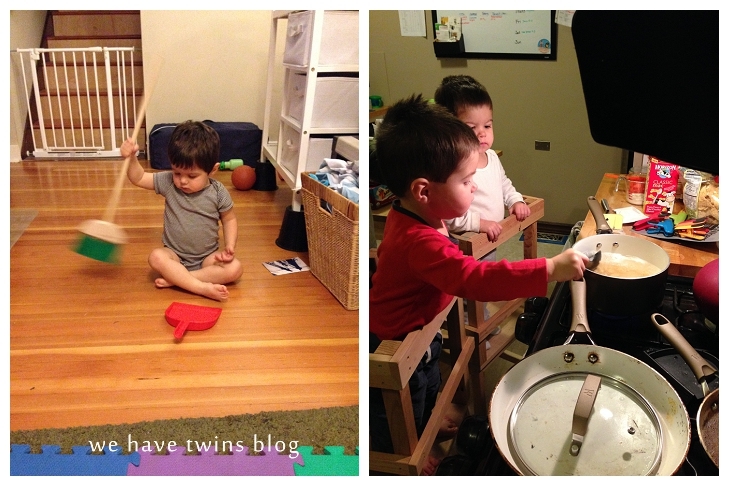 Emmett wants to be a cooker (a cook) and Malcolm wants to be a fireman. We started a sticker chart this spring! Originally it was to help with naptime and bedtime, to convince them to stay in their beds. That basically didn’t happen at all. Oh well. 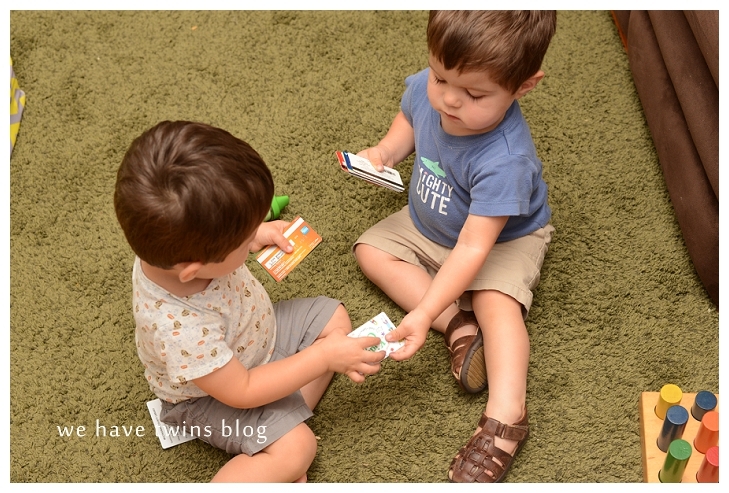 We also gave stickers for things like going potty on their own, bussing their table, brushing their teeth on their own. When they filled a whole row of stickers, they got a reward–an extra episode of tv, or time to play iPad games. It’s pretty much the cutest thing watching them get a sticker and put it on their chart. Sadly, the novelty has since worn off…which I don’t mind too much, actually. If they don’t really care about the stickers but they’re still somewhat motivated or working on those items, then that’s still a win. And there is so much love and affection. I already mentioned the morning cuddles. When I pick them up from daycare, they literally run over to me ready to tackle me with hugs. It is the best. AND when someone comes back from being gone or away, they will say, “I missed you!” with big happy grins and hugs. Again, the best. 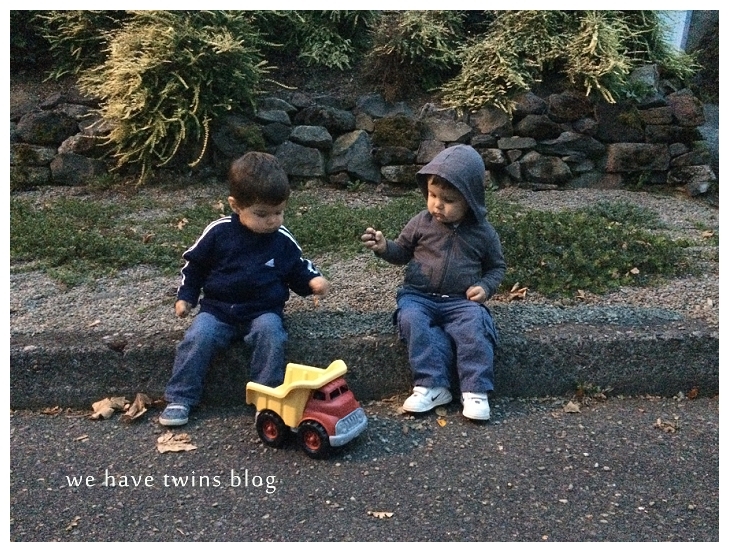 They also are still fairly polite, and ask each other to do things, or one will go get/give something to his brother as a favor. They still like to hold hands with us, and they still want to be carried or get a shoulder ride (which is easier than carrying with arms…but hauling a 35-pound preschooler is rough on the shoulders). They still want plenty of hugs and snuggles at bedtime. They’re really so very sweet. You are THREE!! Three years old! I can’t believe it. You are self-described “big kids” now. You have grown so much! Each of you grew an inch and a half between June and December, and are both right around 36 inches tall (Malcolm, you’re still between 1/2 and 1 inch taller). Malcolm, you also feel a lot heavier, but according to our scale, you weigh 32 pounds and Emmett, you’ve been 30-31 pounds. Your manual dexterity has dramatically increased and improved. You want to do pretty much everything we do. I love seeing you concentrate doing these kind of fine-motor skills activities. You practice writing, you use stamps and paints. Potty training!! This is a big one. We’d been dreading dealing with this, and we knew at least that we wanted to wait after our big trip in September. So we both read a potty training book and scheduled our first no-diapers weekend for the long Columbus Day weekend in October. It definitely took more three days for things to ‘click’, and we felt like we would never be able to leave our kitchen, let alone our house, ever again. Thankfully that wasn’t the case–by the following week you were making clear progress. And a month later you were doing well enough to get you in big-boy undies. One of you can make it through nap with no pullup, and one of you can sometimes. We haven’t tackled night-time potty training at all yet, partly because it sounds like a ton of work and energy, and partly because you’re still sleeping in your cribs. Speaking of cribs, you finally learned to climb out of them. Gulp! However, because you are awesome and we are so lucky, you don’t climb out very often. So we haven’t pulled the trigger about going to big-kid beds yet. We’re crossing our fingers that the transition will go smoothly whenever we do that this year. You’re also still using pacifiers for nap and bedtime. We will definitely transition away from those soon! Your third birthday party was fantastic! We rented the toddler gym at a community center, and a bunch of friends enjoyed playing, doing crafts, and eating snacks and cake! Now that you aren’t babies, we gave ourselves the gift of de-babying the house (or starting to, at least). We gave away the changing table!!! 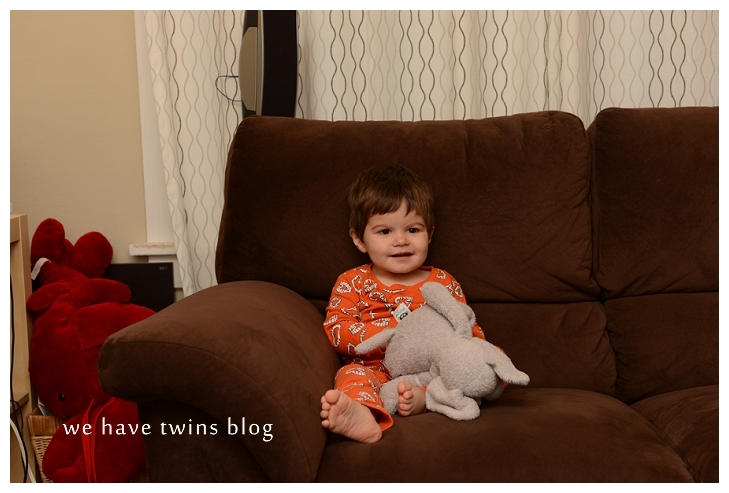 Here’s what our living room (which is also the playroom and your ‘dressing room’) now looks like. Things you eat: as many snacks as we will allow you. You would probably eat crackers all day every day if we let you. And you’d probably want ‘cheesy pasta’ (mac & cheese) every night for dinner. But we rotate things and limit the snacks…which of course you protest. You love frozen peas and corn and blueberries, you adore “smoolies” (smoothies). Malcolm, you’re still more open-minded to trying new things, and Emmett, you’re still a bit picky about new things or certain elements (like if you see “green things” or tomato bits in something, you want us to take it out or you won’t eat it). Your creativity has blossomed even more. 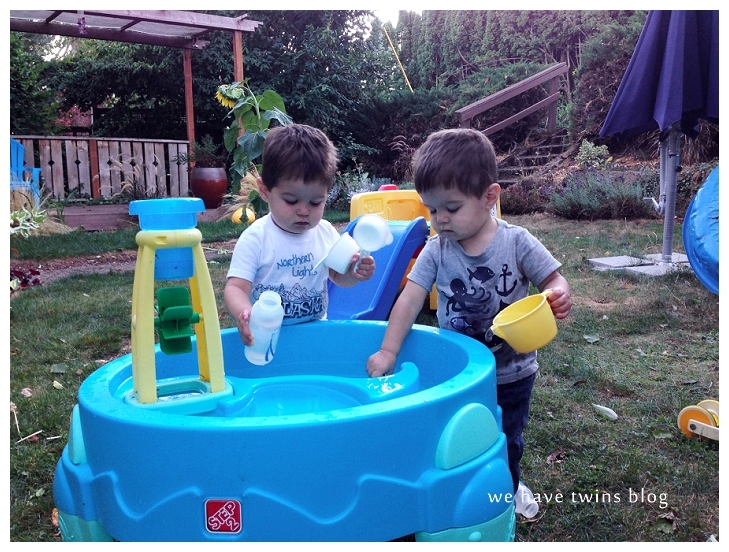 You create toys and ideas and play situations. You pretend to be teachers and if we try to do something or say something, they say, “No! We the teachers!” Awhile ago, you watched an episode of Daniel Tiger that featured ballet, ice skating, and the Nutcracker, and once it was over, you both popped up and created ‘ice skates’ out of empty oatmeal canisters. You are learning letters and spelling! Some must be from school, and some is from playing with the foam letters during bathtime, and some is definitely from SuperWhy (which is your newest favorite show). You know the upper-case letters, and you can spell out words! Malcolm, you pronounce the letter “L” as “ello”, which is freaking adorable. 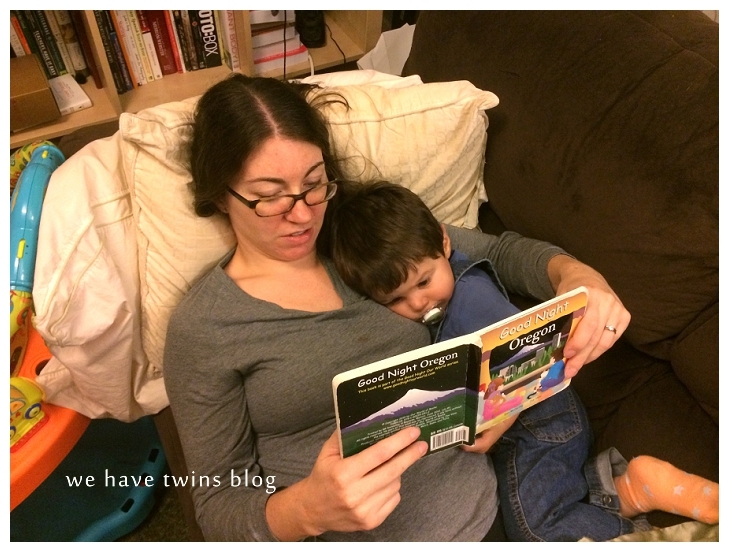 Putting those two together–the reading-aloud process now often takes twice (or thrice!) as long, because there are endless questions and statements and retellings and requests for repetitions as we proceed through the book. You’ve finally gotten into artwork! You are interested in using stamps and inkpads, and finally paint. You were psyched to paint pumpkins for Halloween, and recently you asked to paint on paper…which morphed into painting hands. 🙂 You’re getting better at coloring and seem to really enjoy that too. You have a sense of the past, but it’s all “yesterday”. “Yesterday we got our Christmas tree!” as in several weeks ago. 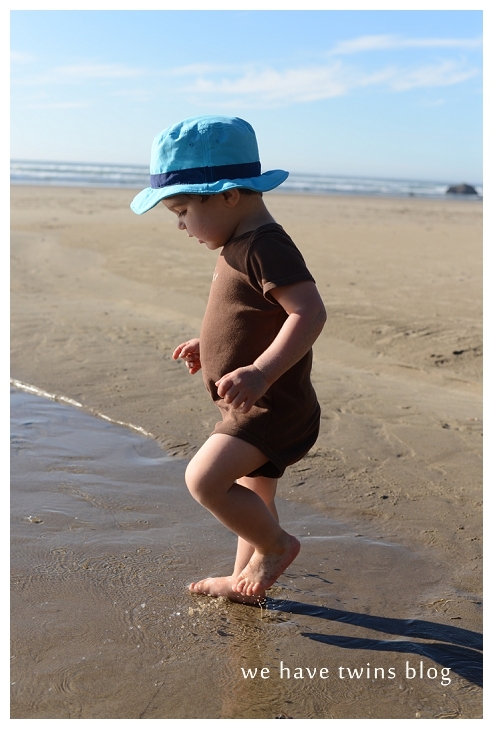 “Yesterday we went swimming,” as in several months ago. You have really good memories, and we are often surprised at the connections you make between happenings of the past and the present. There was one random evening this summer that we were walking outside and there was a skywriter. We sat on the side of the road and watched it write for awhile (it said Cool Moon? 🙂 ) and then like a week later, on another walk, one of you said something about the writing in the sky. Because we passed the same spot that we had watched it. The holidays this year have been SO much fun, and filled with wonder and cuteness. Halloween was fantastic and so was Christmas. You’ve gotten even sweeter about helping each other. If one of you is upset, sometimes your brother will offer a special toy, or a hug. Often, you don’t want it, but it’s still so amazing to see the empathy that you have for one another. Both of you do the same if one of us gets an ouchie–you’ll say, Are you okay, Mama? or you’ll come over and give us a hug. You are now officially travelers!! Your first plane ride and longest trip to date went really well in September. We are really excited for another family plane trip in 2016. Oh–this summer toothbrushing finally stopped being such a battle. Hallelujah. Sometimes we still have to chase you down, but you willingly open up and let us brush. Occasionally you’ll try to brush, but generally you’re playing with something and we’re contorting to reach the toothbrush to all those little teeth. Like all toddlers, you are obsessed with construction equipment. In Washington DC, your favorite part was probably finding and watching any and all tractors, diggers, cranes, excavators, bulldozers, etc. Overall, you’re way more independent. 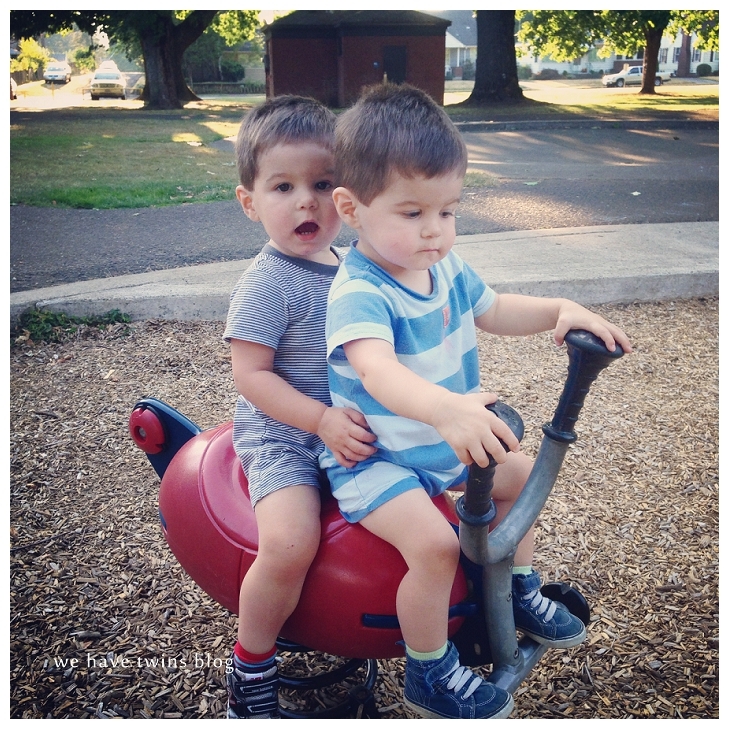 You can bike or scooter the whole way without help, and at the playground you can climb on things without us worrying or fretting. You can open doors and cabinets, and fetch clothes, and even open one of the baby gates (ack!). As always, you go in waves of book obsessions. Here are some that you’ve liked a lot this year: Little Blue Truck, AlphaBlock/CountaBlock, Good Night New York/Oregon, This Book Just Ate My Dog, Chick N’ Pug/Chick N Pug Meet the Dude, What a Wonderful World, Daniel Tiger books, Don’t Let Pigeon Drive the Bus/Stay Up Late, Little Red Truck, The Little Dump Truck. I’ve heard lots of tough things about three-year-olds…and we’re certainly seeing plenty of tantrums and power struggles and enhanced whining. But the increased personality and physical abilities and sense of humor that we’re already seeing is definitely worth the hard times. We love you so much! Ok ok, you are now officially, definitely, not babies anymore. 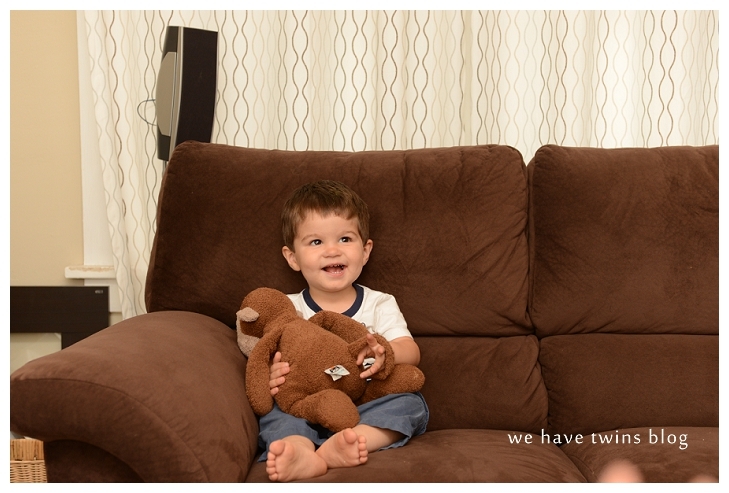 You are TWO! I am trying not to refer to you as babies as much, at least not in public. I guess I have to just call you ‘boys’ or ‘kids’ now. Sniff. Emmett, you are 34.5 inches tall and you weight 28 pounds. Malcolm, you are 35.5 inches tall and weight 29 1/2 pounds! Your singing has increased and improved; you also hum too (especially Emmett, and you generally do some swaying back and forth while you hum and/or sing). With all the new words you’re picking up, you’re really into repeating–meaning that when you say something, we repeat it back to you. Sometimes we can’t figure it out, and you shake your head and say, “no” and then say it again until we figure it out. [One that gave us a lot of trouble is Malcolm’s rendition of “dark outside.” It sounds like “daaahhk…..ah-lash.” Always with the pause in the middle.] Basically any time you say something, you want us to repeat it/confirm it for you. 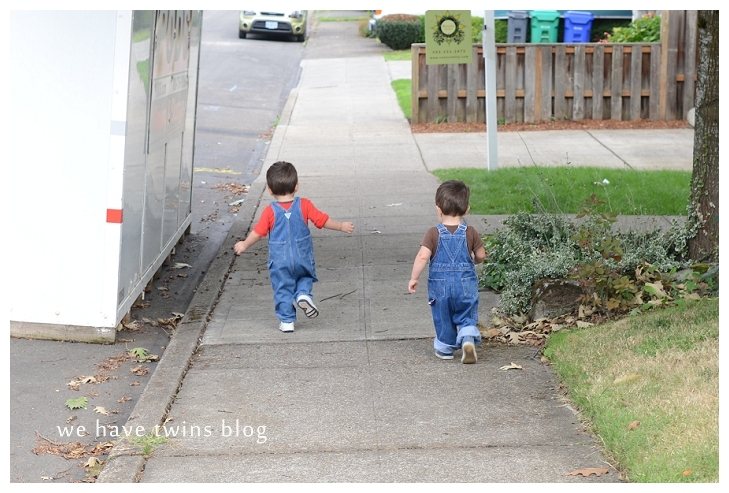 Another fun example is when Malcolm tripped and Emmett, like, re-enacted it and told us about it. You pointed to the spot on the couch and then to your own head, and said something like, “ouch.” You did that whole little routine like three thimes. A huge thing this month has been helping. You bring things to the sink, put clothes in the hamper, hand us things. 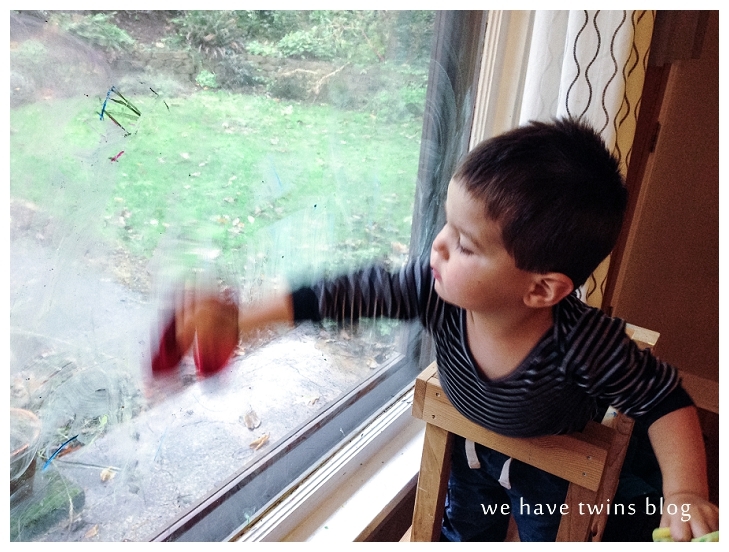 (One day you were coloring with the window crayons, and then Malcolm, you started cleaning it up!) You also love to say, “Help me” but what you actually mean is, that we let you help us. 🙂 So you want to ‘assist’ with tasks like opening or closing the microwave, or retrieving snacks from the kitchen. Your daycare teachers LOVE you–they always rave at how helpful you are, and that you always help tidy up and put toys away. They’re also noticing that you’re talking a lot more…I imagine that you may not talk as much there as at home, but it sounds like you’re getting more and more comfortable at daycare to keep opening up. You’re also getting better at asking to share things between you, and actually sharing them! There is definitely still drama and tears and mini tantrums, but sometimes one of you asks and the other hands it over! 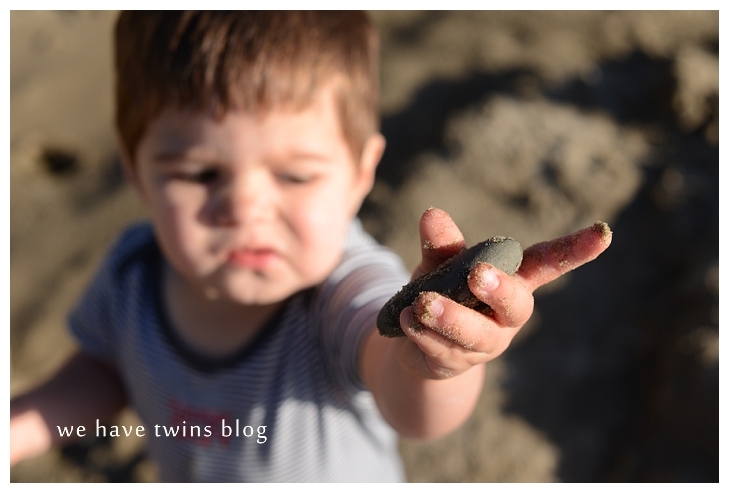 Speaking of sharing and/or tantrums, a lot of them have been stemming from us making you stop doing something, or handing something to us that you shouldn’t be playing with. And this month, we’ve figured out that if we come at it a different way, the result is totally different. (Well, a lot of times. Ok, sometimes. ) Like one time, Malcolm, you picked up a few coins that were on my desk. And I started to try to get it out of your hands and of course you got upset. So then I said, “Malcolm, put it on the desk please. Can you put it down?” And a moment later, you did. Totally calm and cool with it. Sometimes it’s hard for me to really think and not just react, but seeing what a huge difference it makes is a good reminder to do it the right way. I need to be a good example to you in patience and politeness. And it makes life so much nicer for all of us! Something that does *not* make life so nice is the increased frequency of “no” and “mine” being said in various situations. Deep breath. One thing that’s blown my mind a bit this month is that you’re demonstrating your memory–that you actually have and use it. (It’s like you’re actual people or something!) You can go pick out a book that we ask for by name! And awhile back, you dropped/threw a couple crayons into a living room floor vent, and every once in awhile you will suddenly go over there and drop down on your tummies to look into the vent, and start shouting, “UH OH! UH OH! UH OH!” over and over again. Poor Emmett, you must be having some nightmares or bad dreams this month. Some nights you suddenly wake up crying loudly and inconsolably. None of the normal things help you feel better–you slap away your pacifier, you don’t even want hugs (but of course if we try to put you back into your crib you get more upset again). It’s so sad and pitiful! Usually Daddy is the only one who can finally help you calm down. You point at me to go away. Poor baby! This month you’ve been playing pretend a lot, and it is fascinating! We didn’t really know that you knew how to do that. (You’ve probably done plenty at daycare, I guess.) We finally set up the play kitchen that your grandparents got you late last year, and you played with it ALL DAY the first day. Right away you started pouring water (from what I think is probably supposed to be a coffeepot) and refilling it from the little sink. You hand one of us a cup and pretend to refill it over and over again. You like to “stir stir stir” the pan on the stove. You’ve heard us play pretend with our phones enough that you can play with the pretend phone too–you started saying, “Ring ring! Hello? Uh huh okay bye.” Super cute! 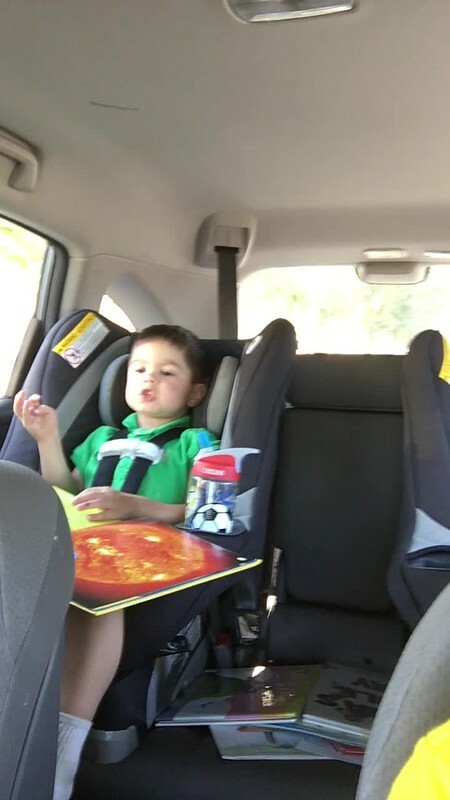 A couple months ago we started bringing books in the car with us, in hopes that it would be some good entertainment for you. This month you finally started paying attention to that and now you frequently read while in the car (not to mention that you make specific requests for which books we should bring for you!). You love it so much that you demand the domelight to be on if we’re driving while it’s dark out. I don’t love keeping that light on, but I do love seeing you excited about reading no matter where you are! And how could I forget Halloween?! We found some very cute costumes at the resale and then Emmett suddenly came down with a fever on Halloween afternoon. (It later turned out to be hand foot mouth…and Malcolm got it a few days later…that was not my favorite week.) But I took you out, Malcolm. We went to a little neighborhood event and then I took you to a few houses to trick or treat. You were very timid and also confused (not surprising–it’s a pretty odd tradition! 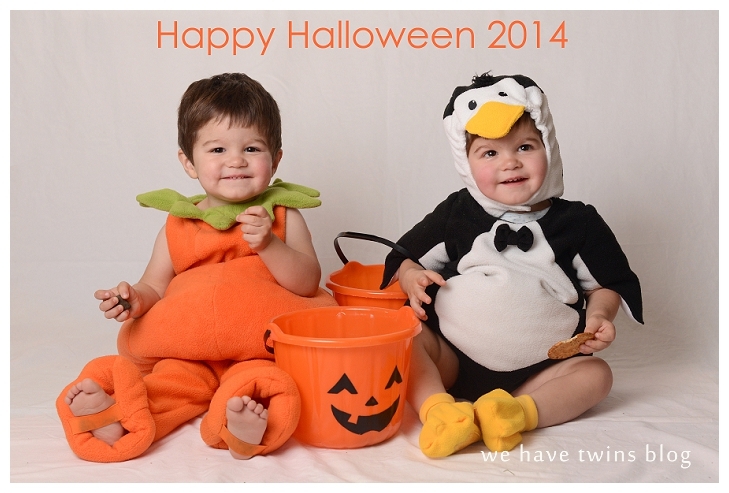 ), but you seemed to like reaching into the bowls of candy, and you even sort of started saying Trick or Treat. It was really fun! 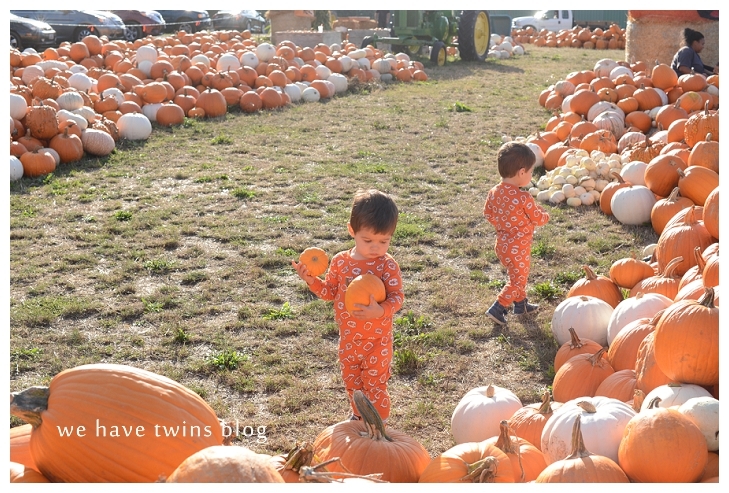 Next year’s Halloween is going to be so crazy, I bet, but this one turned out to be nicely mellow and sweet. I’ve been a little (a lot) nervous about what two will bring…but the last few months have truly been so fun and interesting. I imagine that we will have some tough times ahead with two 2 year olds, but now I’m feeling better about it–I think we’ll have plenty of good times too. I’m excited to watch you keep learning! You’re really entertaining little dudes! 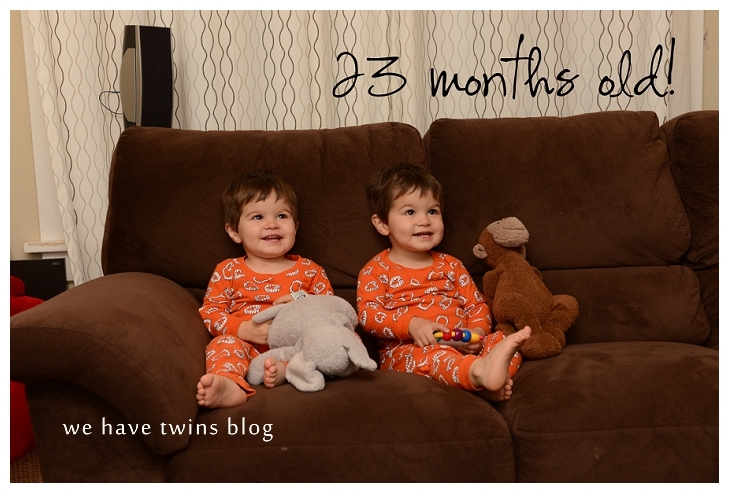 Twenty-three months old! Ack! You’re getting so big, and capable, and interesting. Here’s what you did and learned as 22 month olds. This month has been the last of the beautiful fall weather! We’ve been doing lots of outings and walks to let you burn off energy outdoors. We’re already a little worried about what we’ll do later in the winter when the days are super short. We brought out a kids table and chairs, and of course you love it. So now you have all meals at the table now, and no more booster seats. We’re trying to get better at keeping you in your chairs instead of wandering around. 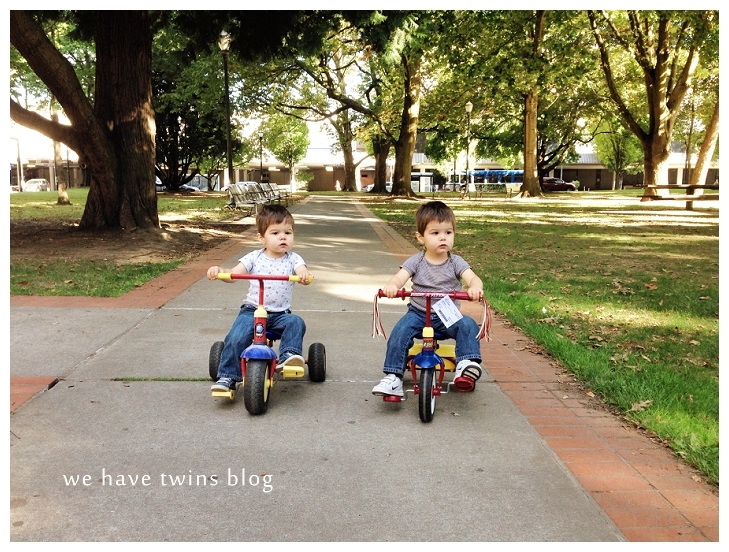 We got you some tricycles at the fall twins resale! You immediately loved them! You insist that we spot you, which hurts our backs. Sometimes you have trouble reaching the pedals, but generally you can definitely ride a bit–maybe soon you’ll be ready to try alone. You love music and songs; you dance even more now! And you’re starting to sing a little too. Of course you like singing the alphabet song, especially when reading Chicka Chicka Boom Boom. You also really like listening to “No more monkeys jumping on the bed” — you have started picking up the hand actions that we do to accompany the words, and can sort of follow along. Same with “If you’re happy and you know it” — you clap, stomp your feet, and say HURRAY! 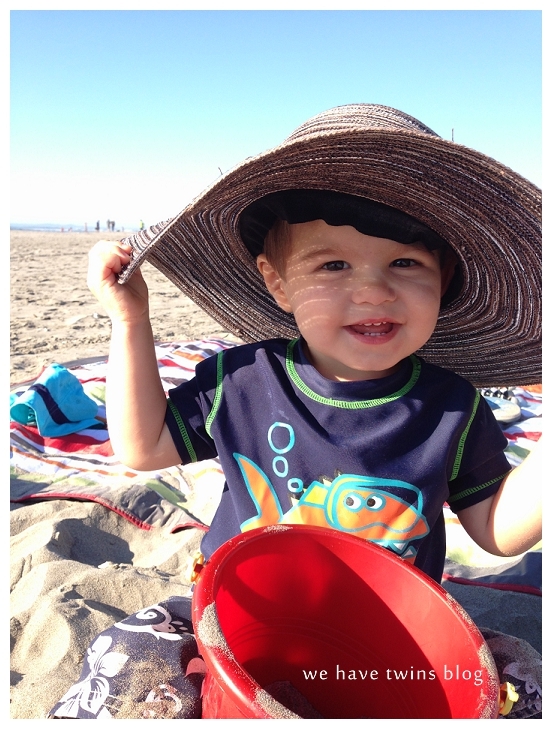 We went to the beach again, which of course we all loved. 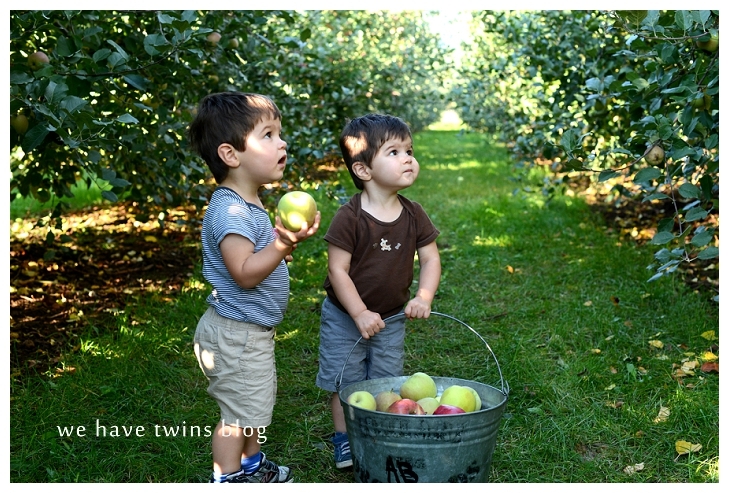 We also went apple picking! You were very interested and excited to point out the apples and to try to pick some. Your interest and skills in sports are noticeably developing! 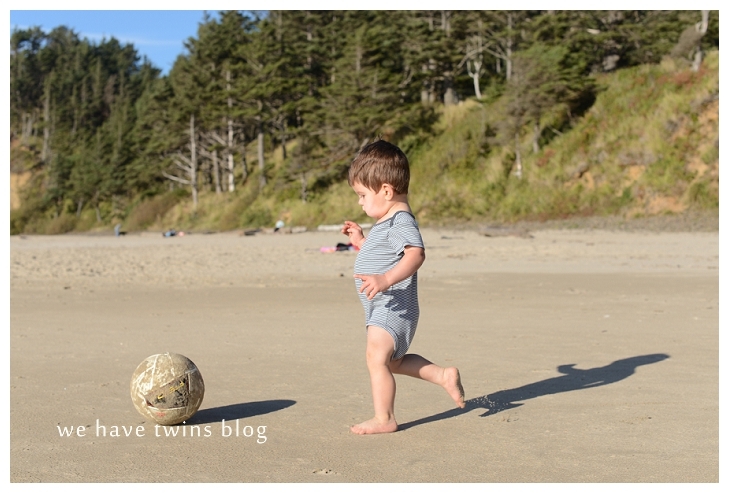 Both of you kick a soccer ball–Emmett, you can practically dribble, and Malcolm, you like to practice kicking while waiting for your turn to get the ball. Emmett, you’re kind of good at basketball! You can actually throw it and make some shots! We can’t wait to get you into some toddler sports classes. Invisible legs: we try to set you down for any reason and you don’t want to be put down, so as you get are brought closer to the floor, you just fold up your legs and try to cling to us so we can’t set you down. Super frustrating! Though we love hugging you, we can’t do it as much as you always like. You are little smart alecks too. When we ask you to do something, sometimes you just say, “No.” So then we’ve learned to phrase it not as a request. 🙂 But sometimes you’ll try to fake us out–like when we say, “Okay, let’s leave your pacifier there.” You’ll grin and pretend to take it out, but then jam it back into your mouth. You’ve also figured how to drag your baby adirondack chairs around and use it as a stepstool to reach something you can’t. You greet us with “hi” and “hello” when someone comes in or downstairs. You also now like to call out from your room–we hear a little voice saying “hi” or “all done” or “more wa-wer” at night or in the morning. It makes us laugh every time, because your little voices are so cute. You also know your own names, and each other’s too! You’ve become much more social in general–you now look at strangers while we’re out and about, and you smile at them and say, “hi.” Many people smile and say hi back, and that makes you very happy! In general, you sweet tiny boys are really fun. 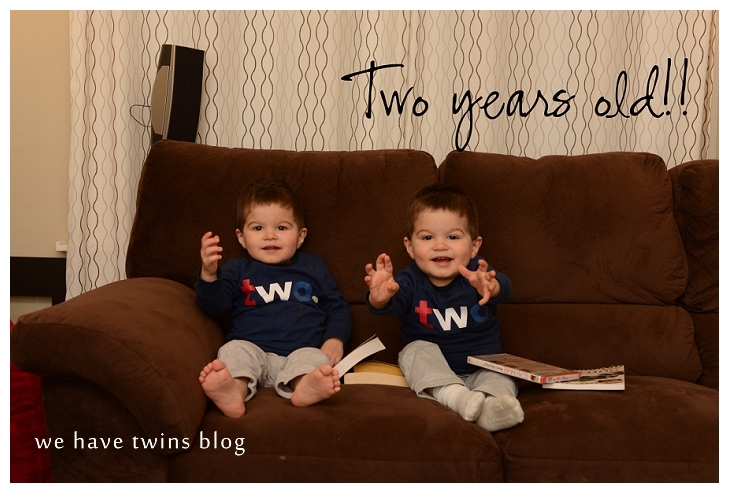 Less than a month until you’re two years old…we can’t believe it! We love you! You are picking up a lot more words, including: aunty, uncle, hello (both with and without the pronounced L sound), peekaboo (which sounds like bee-boo), bath, doggy, milk, please, snack, and you’re trying to identify colors (though most things are yellow). Most impressively to us, you’ve started putting together two-word sentences! “Mama bike”, “Go, dada”, “More milk”, “Hi, mama/dada/nanny”. 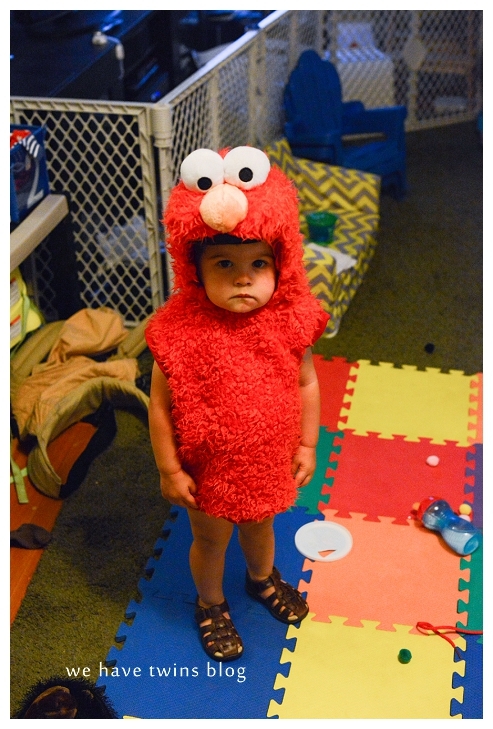 So when I found this Elmo costume at a consignment store, of course I had to get it! You both tried it on but didn’t like the headpiece (though you liked seeing yourselves in it in the mirror). I did take this photo of you, Emmett, and it’s hilarious. You’re getting better at coloring, and are able to do more of it. I figure that you’re getting lots of good practice at daycare. 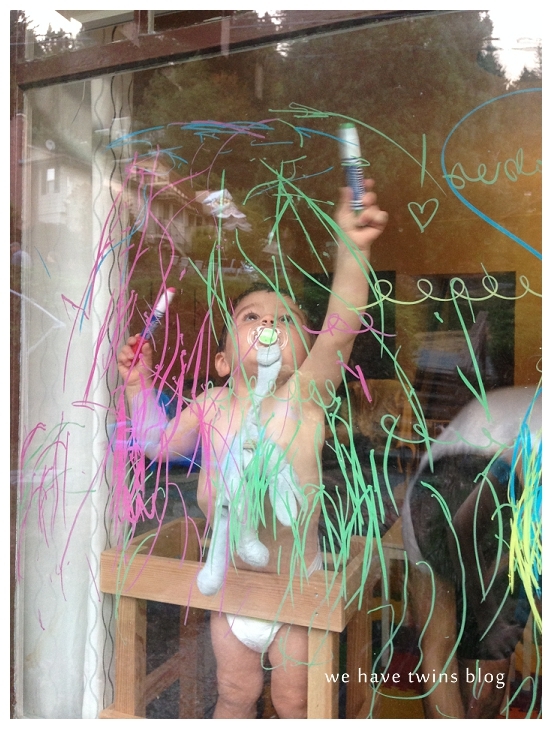 You really love the window crayons we got you! We got you these new buckets. 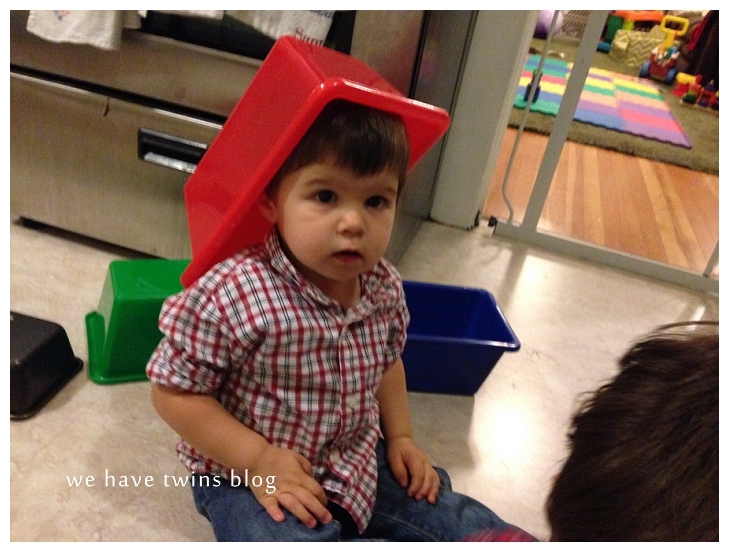 I think I put one on my head to make you laugh and want to play with it…and then you spent the rest of the afternoon wearing them on your own heads! And looking pretty hilariously adorable too. 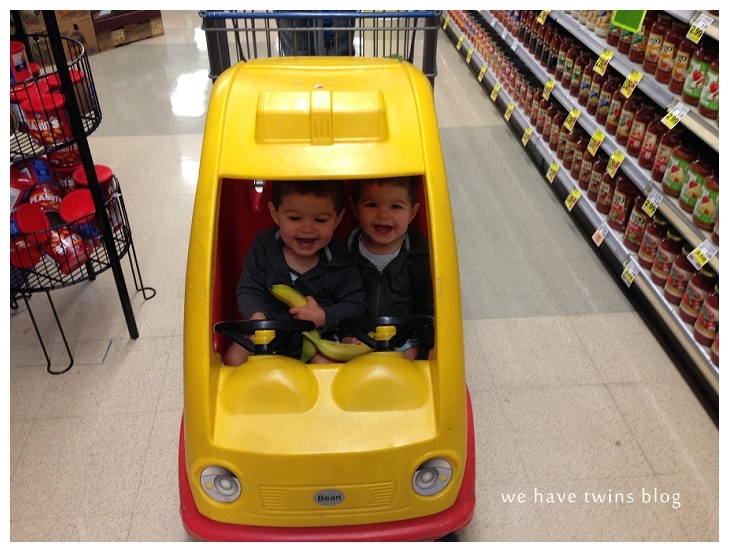 Silly babies! You have become a little obsessed with hanging on things. 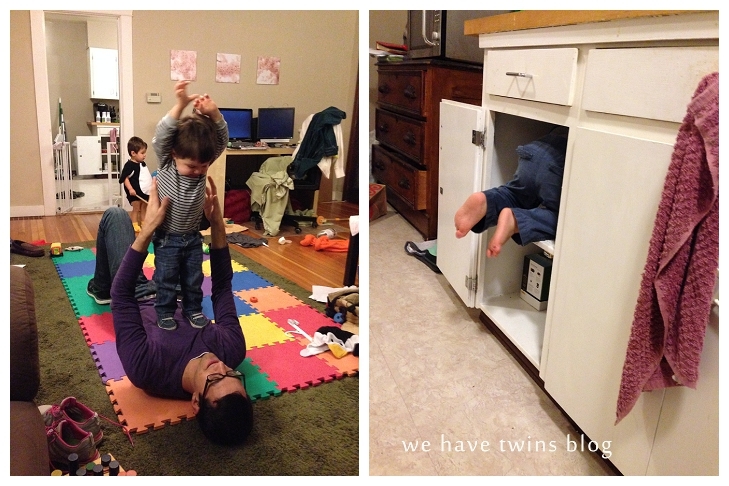 The kitchen island, the changing table, even the baby gates…. 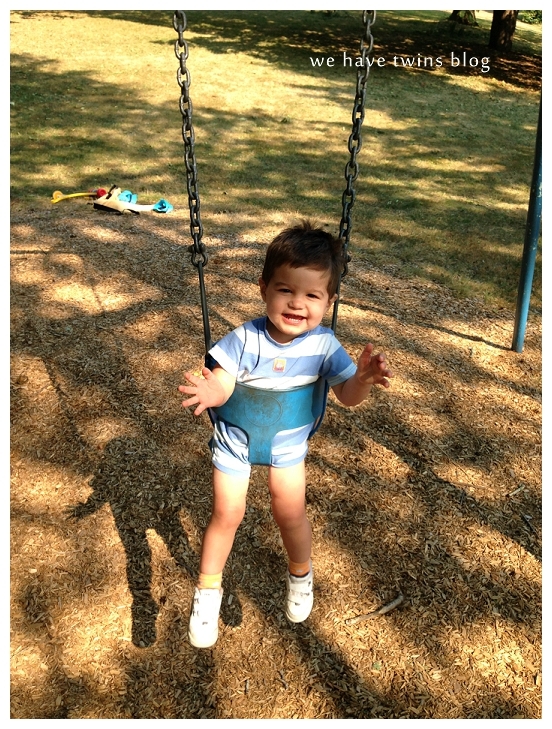 Then you noticed lots of great places to hang at the playground! You have gotten a lot more interested in climbing on things in gneral–you’re now big enough to get up onto the couch, and smart enough to drag over a baby chair or the baby couch to use as a stepstool! You like to sit on the armrests to listen/bounce to music. 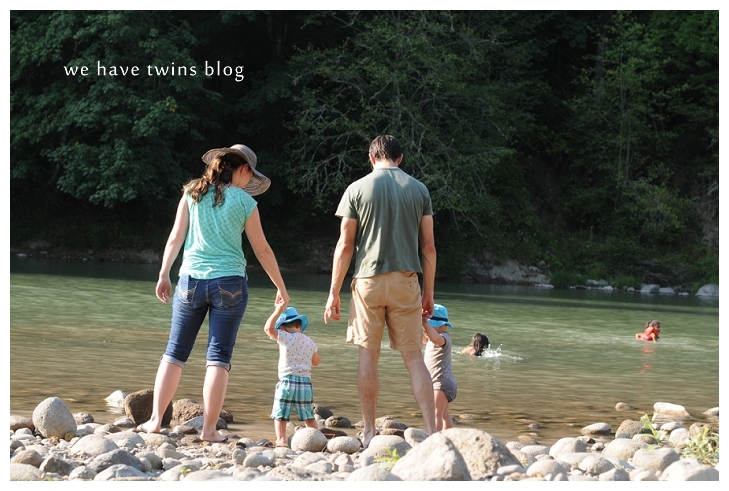 We went to the beach twice this month–once to the Sandy River in Oxbow Park, where you carefully waded into the rocky river…. 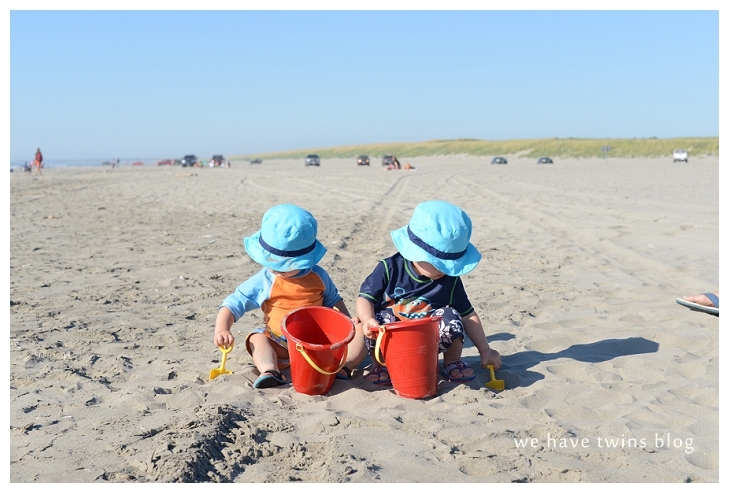 …and we went to the coast again, for a daytrip! Hurray! Lots more fun playing with the sand, and looking at the water. You could probably spend an entire day on the beach! No more high chairs–you began requesting your booster seats for eating instead. We don’t know if the high chairs are done for good…they’re still in the kitchen just in case, but I guess we’ll need to move/sell them soon. It will be nice to have some extra space back, but I already miss how the high chairs kept you nicely contained. 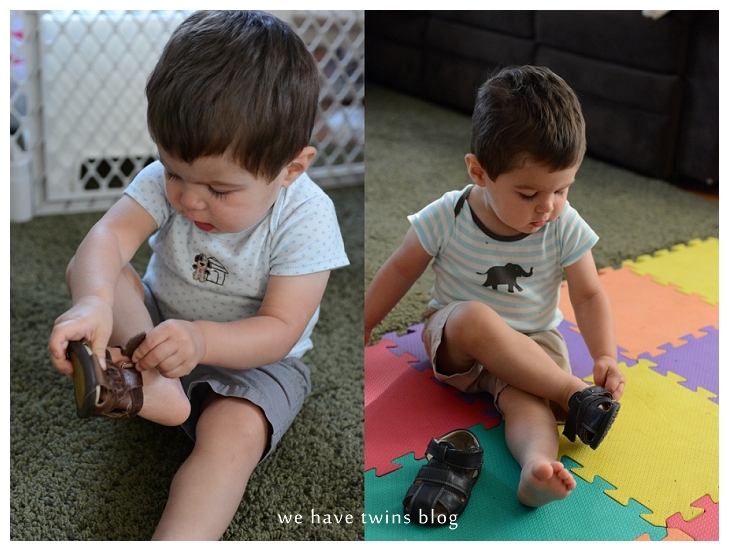 You loved shoes before, but now you love trying to put them on yourselves! You’re not there yet, but I love watching you try (as long as we’re not trying to get out of the house Right Now). And then how can we think you guys are anything but the best little dudes in the world?